A small victory | America loves Sporks! People who have been here a while know my opposition to HFCS in sodas is close to a religious issue. Back when I went to the Bi-Lo supermarket near me, I made a big fuss that the store was out of stock in Pepsi’s “made with real sugar” soda, despite a very specific reassurance that new stock was arriving. The last time, there was only one 12 pack left, on the bottom shelf. I now shop at Walmart. The down side is Chek soda is pretty crappy (but cheap! – $2.80 for 12 pack, currently $2.00 on sale). For now, root beer is not a flavor. I might have to go buy some even if I throw it out! Ahh Bi-Lo. This Nutmegger went to college in the great lakes region in the early 90’s and Bi-Lo was the local supermarket. Fond memories 🙂 $2 for a 12 pack is damn good. Wish they had chek soda back then! Chek was the “house brand” for Winn-Dixie, which is still the parent company – they didn’t retain the Bi-Lo imaging. There have been a lot of grocery chains come and go since I lived here in the 1970s. Harris Teeter (way overpriced) was just recently bounty by Kroger’s. Publix from Jersey City, Florida has invaded big time in the last year. Whole foods has a place across the street from the “high end” Southpark Mall. There is a Trader Joe’s in a place that needs about 100 more parking spaces. Food Lion is the mediocre chain with close ties to where I went to college. The Chek cola is about as I remembered – it is artificially colored, artificially flavored sugar water. The cola would never be mistaken for the “real thing” but it is tolerable. LOL, durn you Fred ! I was at K-roger last week and I generally do not buy any soft drinks, but they had the Big-K grape soda on sale. I picked up a twelve pack. Couldn’t resist. I wanted to see if it had that ‘grape flavor created in a lab in Switzerland’ or close to what you said. My wife saw the cans in the fridge and she said, ‘ Where did the grape soda come from?’ I said K-roger. Its good ! Your sense of taste is very much related to your sense of smell. A lot of what we eat and drink we consider to be “normal” if it matches what chemists at IFF have trained us to believe something tastes like. On my last pickup trip to Walmart, I had ordered 2 12 packs of Pepsi made with real sugar. Jack who runs the operation remembers me because I showed up the day after his store added pickup, when nobody yet knew it existed. He was apologetic that he only had one and he even followed up with the Pepsi driver to find out why. I have a stash of kool aid and five pounds of sugar. I hope that Coca Cola will be great again someday. Coca cola just announced it intends to reposition coca cola as what you order with your steak at Morton’s steak house. HFCS… no thanks! We’ve been trying to avoid that stuff for years, along with all the ‘healthy substitutes’ which seem even worse (Splenda, Stevia, etc). Personally, I was a Coke man, Coca Cola Classic to be exact. I always wanted something ‘fizzy’ with a sandwich, chips, pizza, etc. Stopped drinking it years ago, then started up the habit again last year… and promptly quit again 4 months later. It just didn’t taste the same, plus a slight variation among distributors. BTW, I was told sugar-based Pepsi is distributed in Mexico. ?? My other half prefers water or grape juice, and if she does ‘splurge’, it is Nehi Grape whenever it appears on some obscure store shelf at a reasonable price. Then, a few months ago, we decided to try to recreate a soda drink I had encountered during a marketing test at Magic Mountain, CA in 2000. The correct ingredients turned out to be: Ocean Spray 100% Juice (Cranberry), combined with Canada Dry soda water. Mix ~ 5 oz juice to 12 oz soda water. Store brand soda water is fine, the Ocean Spray 100% C-juice is the key. Pretty much the only place Coca Cola has HFCS is in the United States. Mexican CocaCola can generally be found in Mexican gracery stores, but a little pricey – usually $1 per glass bottle. Another little secret is Coca Cola distributes sugar based coke during Passover. You can spot it because it has a different colored cap. The last time I bought some, it appeared to be bottled outside of the normal distribution channels – the label was on a little crooked and was vague about where it was bottled. Just to clarify about Pepsi, originally they brought back the sugar based Pepsi as “Pepsi throwback” – it was supposed to be a summertime only limited time deal, but it hung around for another year. 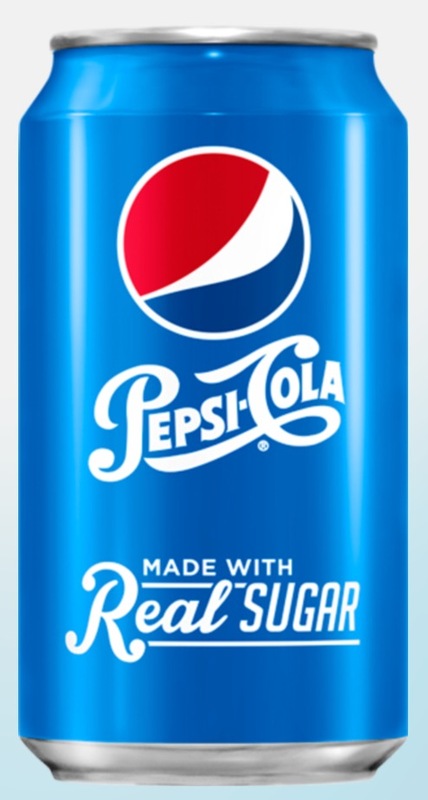 They rebranded it as “Pepsi made with real sugar”. My sense is it probably is beet sugar rather than cane sugar.